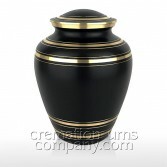 This is the Classic Black cremation urn, it has a jet black matt enamel, decorated with several simple gold bands around the lid, shoulders and base. It is manufactured to the highest standard and is specifically designed to hold the full ashes of an adult. 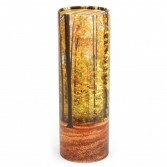 The Autumn Wood ashes scattering tube (large) is of excellent quality with a peaceful woodland scene covering the entire tube, and is specifically designed to make scattering ashes an easy and dignified procedure. 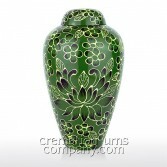 This is the Spring Garden cremation urn, it has a beautiful green enamel, decorated with hand painted flowers and leaves. 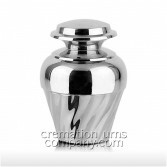 It is manufactured to the highest standard and is specifically designed to hold the full ashes of an adult. 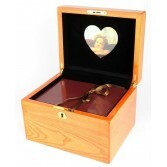 The Camden Ashes Casket is a stunning wooden ashes casket of the very highest quality. It has an amazing high gloss finish with beautiful inlay work on the lid, and is lined with luxurious velvet with a heart shaped photo frame inside the lid. 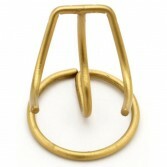 It is secured with a little lock and key and the ashes are placed in a secondary internal box for extra security. This is the Bedford Black No6, it has a beautiful black body and lid, decorated with a gold paw prints design. 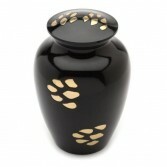 It is manufactured to the highest standard and is specifically designed to hold the full ashes of your departed family pet. 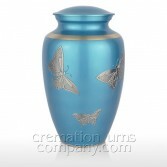 This is the Pewter Butterfly cremation urn, it has a satin blue finish to the lid and base and is decorated with beautiful pewter butterflies. It is manufactured to the highest standard and is specifically designed to hold the full ashes of an adult. 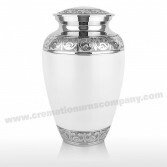 This is the Honesty cremation urn, it has a smooth white satin enamel, decorated with stunning engraved chrome bands around the lid, shoulders and base of the urn. 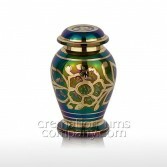 It is manufactured to the highest standard and is specifically designed to hold the full ashes of an adult.